Ubuntu device images are released on a set of channels at the system imageserver. A channel is a timeline of images, designed to serve a particular purpose. When a user installs Ubuntu, they will be prompted to choose a channel and a device, and by default, the most recent image in the channel for the particular device will be used. Alternatively, a particular image can be specified by version number. After an image channel has been chosen for installation, it will be used to provide Over-The-Air (OTA) upgrades to the device, and an users will generally stick to it. However, channels can still be switched at a later point using command line tools. For most purposes, a pair of channels is used. The main channel (e.g. ubuntu-touch/rc/ubuntu) and a proposed channel (e.g. ubuntu-touch/rc- proposed/ubuntu) which contains images that are being tested for 'promotion' to the main channel. 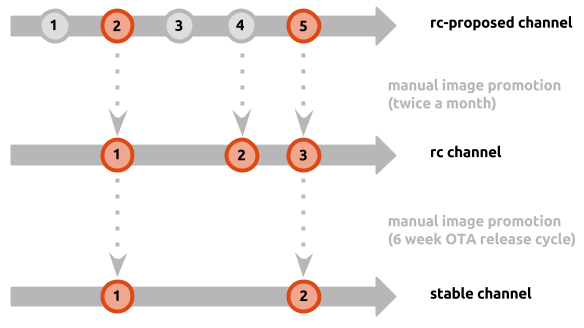 Proposed channels are often built daily by Ubuntu's Continuous Integration infrastructure, and the higher quality images are promoted to the non-proposed channel. Some channels follow specific promotion schedules. Build IDs are defined within a specific channel. Note: the Ubuntu phone release process is based on the concept of promoting images at a consistent release cadence to incrementally more stable channels until they reach end users. Each promotion to a more stable channel requires the image to have passed a strict QA criteria of automated and manual tests. Ubuntu images are generated daily (often multiple images per day) and are thoroughly tested with automated and manual tests to ensure they comply with Ubuntu's QA standard. These daily images are distributed on the '-proposed' channel sets and are only promoted to their non-proposed channels once they comply with a set of quality criteria. At any time, there are always two daily-built channel sets working: devel and rc. Images built from the rc channels eventually become the stable images. The following table will quickly guide you through the decision of choosing an image channel. For more detail on channel names and their contents, see the sections below. Generally whenever you want to test Ubuntu Touch on your phone, we recommend using one of the ubuntu-touch/stable/ channels. Our stable channels are updated on a approximate 6-week cadence with the latest features and development. The standard Ubuntu-based image channels. Current channels are divided into 5 groups, sorted accordingly to the stability level of the images they provide. Each channel group then has a number of channels created accordingly to the requirements and/or type of the device. This list is not exhaustive, please refer to the Listing channels section for a complete channels list. Manually promoted images that reach end-user devices. This is the channel that should be used for everyday use phones. The bq-aquaris.en channel is also the channel which all commercial BQ devices are flashed from. Manually promoted images from ubuntu-touch/rc-proposed/*. An image from this channel is normally promoted once every six weeks to the stable channel as the new official OTA update. Automatically built images that are candidates for the rc and later the stable channels; these are currently built from ubuntu/vivid + stable-phone- overlay PPA. RC promotion evaluation in general happens twice a month. Manually promoted images from ubuntu-touch/devel-proposed/*. Promotions do not follow any specific schedules. Automatically built images from the latest devel series (currently ubuntu/xenial). This is the channel is to be used by developers for system development purposes only, absolutely no guarantee of stability. Development channels here are not analogue to the traditional OS series and are independent entities from the stable channels. Their use case is limited for testing a baseline switch before change the stable series to more recent series, not necessarily consecutive ones. Warning! : the development channels are not recommended for general use, and unless you need to explicitly use them for a particular purpose, you should rather pick one of the stable channels instead. All channel names are prefixed by ubuntu-touch/. You might want to learn about the Ubuntu release naming scheme before continuing. The <stability-level> marks how mature the images hosted in the channel are, also marking their potential quality. Currently this can be either "devel", "rc" or "stable". Devel images are generally the least tested and therefore most risky to use. Those images are considered development images, meaning based on the latest Ubuntu series and meant only for system developers to be able to do development - there is no guarantee of phone features working. Do not mistake "devel" images with "latest development", as the main development focus is always happening in the rc and stable channels. RC images consist of changes that have been tested before release and are potential candidates for stable releases. Stable images are manually copied RC images after reaching specific quality criteria. All non-proposed <stability-level> based channel sets are basically manual channels with images manually copied over after reaching specific criteria, while their "-proposed" counterparts include daily-built images. Channel images and related files are hosted and published here: system-image.ubuntu.com The channels.json file is the master list of current channels and related information, including channel aliases and image data for each device.